Cuddle with your pet or play a game of checkers with your kids on this Minuteman Oriental rectangular hearth rug. Don't settle for a faded, cheap carpet that will easily unravel. Go Minuteman, and get a brighter, better product. 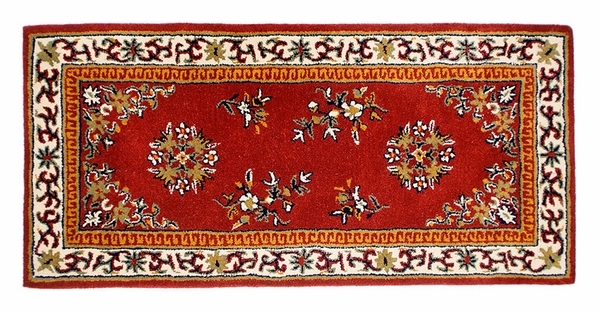 On this Minuteman rectangular rug, three central designs stand out against the burgundy background bordered with vines and flowers. The wool used is completely genuine-not recycled. Let this Minuteman Hearth rug catch the eyes of visitors in your entryway or grace the floor of your den. This Minuteman Oriental rectangular hearth rug meets the Part 1631 (ff2-70) safety guidelines for use around the fireplace and spreads to an area of 56x26 inches. This carpet looks elegant and is well made. It seems to be quite fire retardant. As other reviewers have mentioned, this rug is very large. It will protect your floor even past where many normal hearth rugs stop. A very nice and functional product.